But finally we were all back together, cars were parked and luggage was checked and we were heading to our gate. We walked and walked and walked, and then we saw what we thought was our concourse and the gate numbers are very close to our number and we think, “Yeah, we are there!” We saw a Starbucks booth nearby and I know many of the team were thinking it was time to stop and smell the coffee … or is that drink the coffee? I think we needed to drink it at this point. So I said, “Let’s get our things to the gate and then we can get coffee or food or anything else we needed before the plane heads out.” And we walked and walked and walked some more, but there is no gate. And then we realized we had to go to a different concourse, we had to actually go down the steps and then up the steps and then onto the Sky Tram. And then down again and even further through the terminal. We were nowhere near our gate at the spot we originally thought was our destination. And the more we walked, the more I giggled inside. Isn’t that just like life. We are going along, and we hit a bit of a rough patch and then it’s smooth, we think all is well, we think we’ve arrived at our destination and then we realize, nope, still got 20 more miles ahead. And it’s all hills! Or maybe you’ve been walking with Jesus for a time and you think, ‘I got this spiritual thing down, Jesus and I are tight’ and then the next thing you know something happens and boom, the rug gets pulled out from under you and although you thought you had it figured out, you realize you have nothing figured out and you are back to square one. And that’s okay. Just keep walking … that was the lesson that day from the airport. The gate was somewhere else from where we were, we just had to keep walking. Let us not stop walking until we are in front of Jesus! 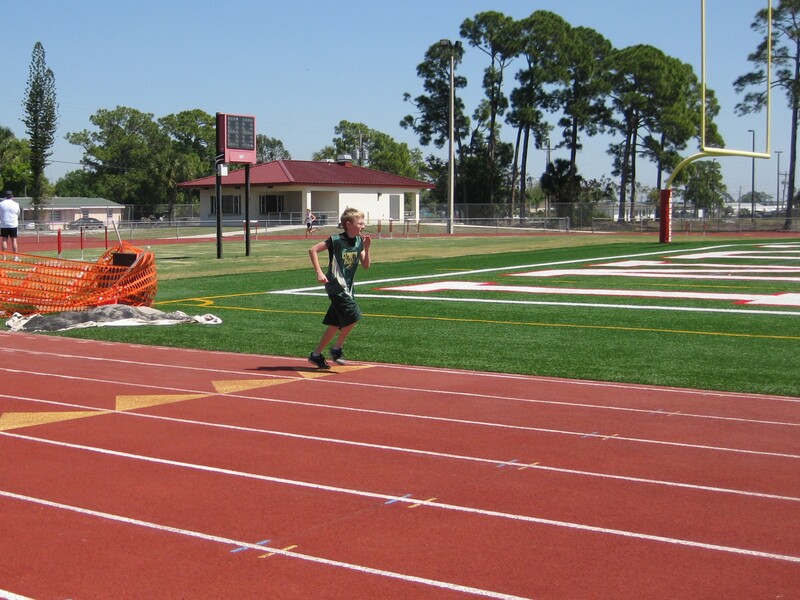 Carson had his first track meet of the season on Saturday. He was running in two events, the 800 meter and the mile. The 800 was first, two laps around the track, not really that difficult, considering last year he ran the 2 mile, which was 8 laps around the track. But during the first event, something was in the air around the track and when he was finished running, he was having difficulty breathing. Both he and his friend, who ran the race with him, were coughing and choking and they both looked a little green. Carson told me he didn’t think he could run the mile. I prayed for him to have strength and endurance and told him to take a walk to clear his head and whatever he decided to do, I trusted his judgment. If he could run, run, if he felt he couldn’t, that was okay too. When it came time for the boys mile, I was wondering what decision Carson had made. I knew how much easier it would be to just not run. A mile, when you aren’t feeling well, is a long four laps. But as the gun went off, I saw Carson in the pack, heading around the track. No, Carson didn’t win the race. He didn’t even place. But he ran those four laps, never missing a step. I was so proud of him, he was pushing through his discomfort, towards the goal, finishing the race. Life can be difficult, bad things can happen. Loved ones die. Marriages end. Jobs are gone. Illness happens. Sometimes we just want to quit it all. We want to curl up in a ball in our beds and not get out. Or even worse, we want to jump off bridges or put guns to our heads. It seems like the only way out of the mess is to give up. Father, thank you for giving us hope. The world is beating us up right and left but you are our anchor in the storms of life. You bring peace to our battered minds, you restore our souls. Thank you Jesus for giving us the strength to persevere, so that we can finish the race.